I’ve been speeding through some sewing recently, testing the spring patterns and making a few things for S and for myself at the same time, and this has started me thinking about strategies for efficient sewing. My personal sewing time is scarce because of a few projects we’re finishing up, and I need to make the most of it if I’m going to have anything made in time for spring (and a trip to Palm Springs in a week or so!). A few of you mentioned an interest in this same theme, so here are a few thoughts about the topic. If you’re able, cut out several projects at once so they’re ready for you when you have time to sew. When we’re not too busy, I sometimes take an afternoon or a few hours on a weekend to cut out several projects in advance. That way I’m ready to go when I finally have time to sew. Make cutting an enjoyable process by putting on some dance music to keep you going, and you could even invite a friend to join you so you can help each other cut out your fabrics and have fun in the process. 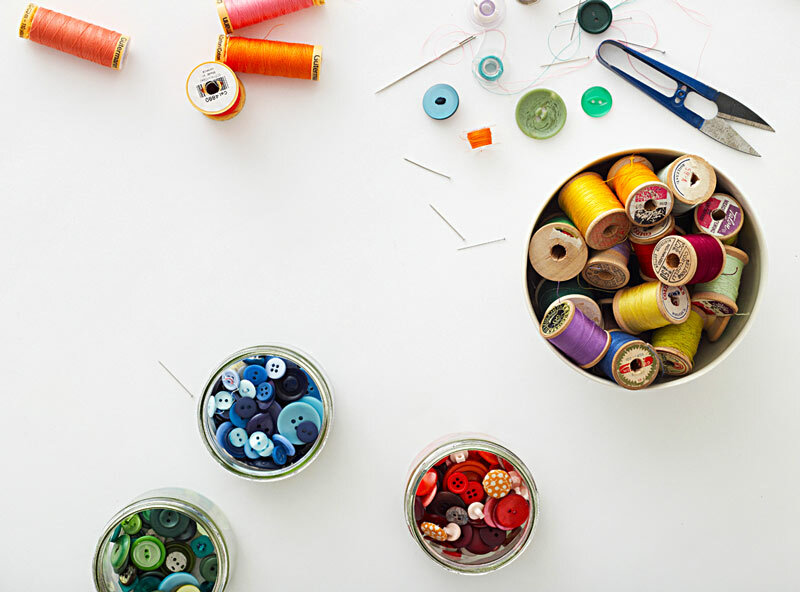 If you don’t have a dedicated sewing space, find a place to store your sewing materials together where you can easily get them out and quickly put them away again when you’re done. For a long time I sewed at the dining room table, and I kept my sewing machine and supplies in a large cabinet right next to the table so I could set up and take down my pop-up sewing studio in a matter of minutes. Sometimes when you’re familiar with the steps involved in making a project you can set yourself up to sew multiple steps at the same time. For example, I often get everything ready to assemble the collar, make the pockets and sew the belt for a pattern all in one go. Then I move away from the sewing machine to press the seam allowances and set up my next little sewing binge. Note, however, that this usually works best if you’re already familiar with the sewing steps in a pattern, so be sure you’ve read through the pattern in advance and are familiar with the steps involved. If you’re a less experienced sewist you might want to wait until you’ve sewn the pattern once or twice before you attempt this. You need to be able to think methodically about the construction method to make this step work, so be careful you don’t overwhelm yourself and get confused. I’ve said many times before, but one trick that works best for me is to set up the next seam before I quit sewing for the day. I don’t sew that seam, but it’s waiting for me the next time I sit down. This means that it’s easy for me to pick up again where I left off. I don’t need to think about what step comes next because it’s already waiting for me. Doing this helps to refresh my memory about what comes next, and it also helps me to jump back into sewing without reservations. I often sew just a seam or two a night, but I’m still making progress even with that very limited amount of sewing time. Do you have any additional tips to share? I’d love to hear what strategies work well for you! Fabulous tips, I especially love the one about keeping projects that are already cut into large ziplock bags. I was cutting bulk amounts of projects at one time, but then just leaving them in a pile on the floor – which were then getting lost or creased. So I will definately be using those bags from now on! Thanks! Using the sleeve board at the sewing machine is a good tip. I bought a Teflon ironing mat to avoid putting up the ironing board, but it tends to get too hot. I’ve also considered buying one of those electric craft irons for the seams instead of using my big Rowenta iron every time. Sewing without a dedicated sewing space is always extremely hard. I’ve recently started doing some of these things and it helps tremendously. I’m able to squeeze in an hour here and there if everything is ready to go. With three kids that are about to turn 2,3, and 4 all within a week of each other there is little time for sewing. I also drive my husband crazy with moving my iron and ironing board around the house so I can press and cut at the coffee table while watching my shows after the kiddos are asleep. I have a pop-up sewing station on my dining room table and a big closet near by to store things so these tips will come in handy. I think the ziploc baggie idea and keeping all the notions in there is a fantastic idea. Similar to #5, I’d add that I also try to get as much of my basting done in batches as possible because it reduces the amount of fiddling with the machine settings and thread colors. Clean up your work area! Stop a few minutes before pack up time and leave a neat area,it is so much more appealing to come back to. I love ziplock bags,make sure you label the size and pattern on the bag if you are doing a lot of pre-cutting. I always have things ready to go,cutting or sewing,so if I have 5 minutes here or there I can do a little. It adds up. I try to do all my basting, staystitchung and gathering ahead of time with thread from the previous project. Then it stands out better and doesn’t slow me down uring construction. Thank you for sharing your tips. They were an excellent reminder that common sense + planning usually does make everything work better. Steps #5 and 6 were both new to me. I’ll test the steps this week as I begin sewing Easter dresses for my daughters. With four girlies asking for Easter dresses, I decided to start this month! i really like the setting up the next seem for a “refresher” and motivator. a couple seams per night… wow what a great idea. i like the baggies labeled dea too. mine are in piles, in a basket. what i need to REALLY work on is finishing what i start before i start more. but some things are so much more fun to sew…. A lot of my sewing is quilting, and I buy rectangular storage boxes from the UPS shipping store to keep projects organized. I buy stick-on label sleeves from an office supply store which I stick to the side – then I can slide in paper noting what is in the box. For sewing for my granddaughter, I can keep several projects in one box with pattern, notions (in the zip-lock bags!) included. They are tidy and out of the way until I can get to them. Whenever possible, I like to sew in sleeves before sewing the side seams. It is easier to work with an open area, and I do not stick myself with the pins as much. 1. New project, new needle – ALWAYS change your needle when starting a new project. 2. Accurate cut = better quality finish – Take the extra time needed to carefully pin and cut your projects.